We participated in the NSF Wintertime INvestigation of Transport, Emissions, and Reactivity (WINTER) aircraft campaign. WINTER took place in February-March 2015, with the NCAR/NSF C-130 aircraft conducting 13 flights sampling the lower troposphere during both day and night. The goal of this experiment was to provide observations allowing us to examine poorly understood wintertime processes near polluted regions in the NE US. Shah, V., et al. (2018). Chemical feedbacks weaken the wintertime response of particulate sulfate and nitrate to emissions reductions over the eastern United States. Proceedings of the National Academy of Sciences. PDF. In the eastern United States, substantial cuts in sulfur dioxide and nitrogen oxides emissions have considerably lowered particulate sulfate and nitrate concentrations for all seasons except winter. Simulations that reproduce detailed airborne observations of wintertime atmospheric chemistry over the easte rn United States indicate that particulate sulfate and nitrate formation is limited by the availability of oxidants and by the acidity of fine particles, respectively. These limitations relax at lower ambient concentrations, forming particulate matter more efficiently, and weaken the effect of emission reductions. These results imply that larger emission reductions, especially during winter, are necessary for substantial improvements in wintertime air quality in the eastern United States. Our results were highlighted in a press release. Shah et al. (2019). Widespread pollution from secondary sources of organic aerosols during winter in the northeastern United States. Geophysical Research Letters. Link. 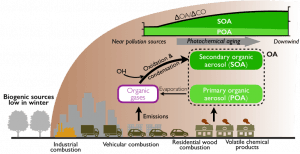 Secondary organic aerosol (SOA) from pollution sources is thought to be a minor component of organic aerosol (OA) and fine particulate matter beyond the urban scale. Here we present airborne observations of OA in the northeastern United States, showing that 58% of OA over the region during winter is secondary and originates from pollution sources. We observed a doubling of OA mass from SOA formation in aged emissions, with unexpected similarity to OA growth observed in polluted areas in the summer. A regional model with a simple SOA parameterization based on summer measurements reproduces these winter observations and shows that pollution SOA is widespread, accounting for 14% of submicron particulate matter in near‐surface air. This source of particulate matter is largely unaccounted for in air quality management in the northeastern United States and other polluted areas. Jaeglé et al. (2018). Nitrogen oxides emissions, chemistry, deposition, and export over the Northeast United States during the WINTER campaign. Journal of Geophysical Research. Link. 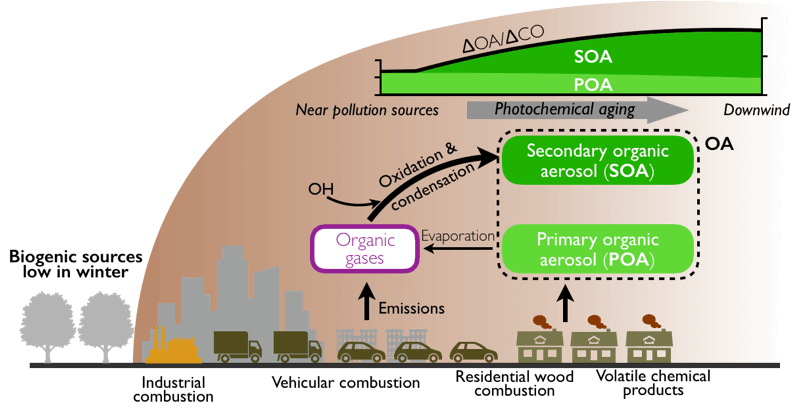 Nitrogen oxides are a key family of pollutants emitted by cars, electric utilities, and industry. The fate of nitrogen oxides remains poorly understood especially during the winter season, when low sunlight leads to their persistence in the atmosphere. We analyze comprehensive aircraft observations of nitrogen oxides and their atmospheric products over the Northeast United States during winter 2015. This detailed chemical information allows to resolve a long-standing overestimate of the oxidation products of nitrogen oxides and places new constraints on their deposition to land ecosystems and export to the global atmosphere.